When your application is doing some work in the background, it’s common to show progress in a ProgressBar within your application. In Windows 7 and Windows 8, you can also make use of the underlying Windows API to show an integrated progress bar on the application’s taskbar icon. The progress is rendered using a green bar that moves across the width of the icon. This is helpful for showing progress while your application is minimized. Below is a complete example of how you can update the taskbar icon to show progress. Some of the low-level API code was taken from the Windows API Code Pack on MSDN, which contains examples of many more API functions that you can call. You can use the Windows API Code Pack as an external library, or you can call the low-level Windows API yourself. The code below does the latter and is the minimum code required to show progress on the taskbar. To start with, we define the following code in a TaskbarAPI.cs file. This provides a managed wrapper around the underlying Windows API calls. The main thing is the ITaskbarList4 interface, in its entirety. We then define some extra stuff for the types that appear in the interface. /// WPARAM value for a THUMBBUTTON being clicked. Next, we define a little helper class that calls the API on our behalf. We use a Dispatcher so that we can get access to the application’s main window, doing this on the UI thread. 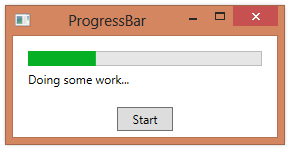 The XAML for the example just contains a ProgressBar and a Button to start the background operation. Our code-behind is also fairly simple. When the user clicks the Button, we start an operation on the background thread and periodically update both the ProgressBar control and the progress bar built into the taskbar icon.